Hortus Camdenensis | Babiana disticha Ker-Gawl. Leaves lance-shaped, hairy, flowers pale yellow or shades of blue marked with yellow, fragrant. To 20cm. [RHSD, Hortus, CECB]. ‘Cultivated, according to the Banksian Herbariam, at Kew Gardens in 1778.’ [BM t.576/1802]. 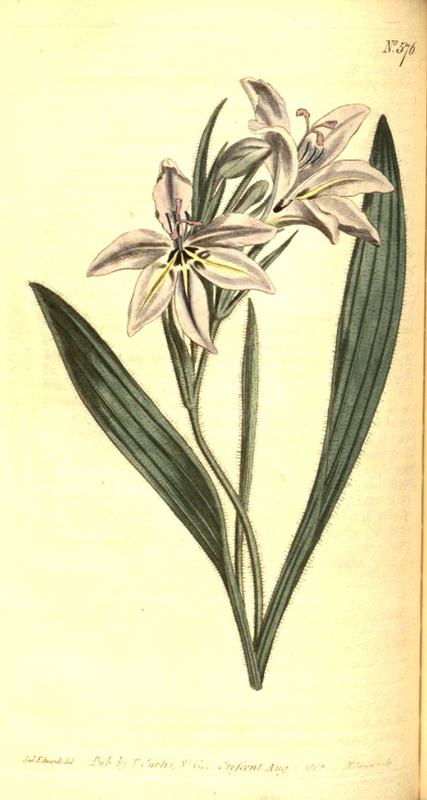 ‘Is easily increased, but like the whole of this genus is not so free to blow as Ixia, Watsonia or Gladiolus; we think it advisable not to remove the roots from their pots above once in three or four years, as these require to be of a good age before they flower at all, and are not nearly so liable to rot as many of the species of Ixia and Gladiolus.’ [BM t.626/1803]. Ker Gawler regarded the two plants he described as separate species although they seem to vary only in flower colour. Received per ‘Sovereign’ February 1831 as Gladiolus plicatus. [MP A2948-2]. Both Babiana disticha and B. plicata are marked with a ‘c’ in a copy of Loddiges’ 1836 catalogue meaning ‘grown at Camden’. Babiana stricta caerulea is also marked, but the ‘c’ is crossed with a single dash. The meaning is unknown but as it doesn’t appear in the 1843 catalogue it was probably lost. [CPA].